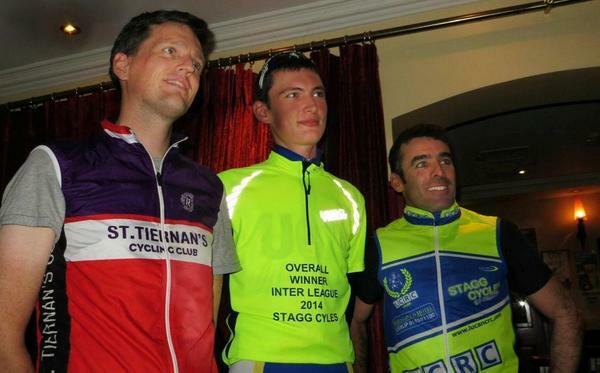 August 29, 2014 – FERGAL MAY and Lawrence Clifford were the St. Tiernan’s winners on Tuesday night as the 2014 Inter-club League concluded at Black Bull. The race around the Green Sheds circuit and finishing at the cottages was a clean sweep for Lucan, but May retained his second-place position behind UCD’s Sean McKenna in the league table, holding off Lucan’s John Caffrey by three points. Recording 96 points, Clifford landed fifth and the first unplaced St. Tiernan’s rider was Ruairi Ferrie in 13th, beating Martin Vereker and Adam Greally by one and two points respectively. The Grasshopper Inn in Clonee hosted a warming presentation ceremony at which winners received wine, prize money and vouchers and water bottles from Stagg Cycles. No Replies to "May and Clifford headline as ICL 2014 concludes"